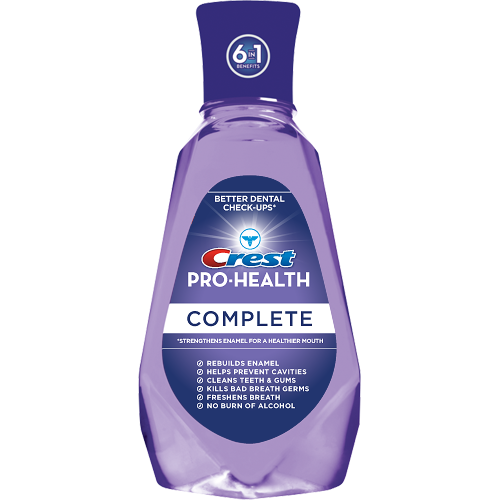 We were picked to give an all-in-one mouth rinse product a try, and so for the past couple weeks, we've been using the Crest Pro-Health Complete Rinse day and night to see if the formula's six different benefits work better than brushing alone. 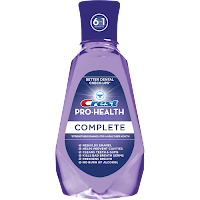 While I haven't been to a dentist to see in the past month to see how it might affect things like cavities, I wanted to see how this product would help me in the next month. Before this test drive, I would brush with a whitening toothpaste, floss daily, and use a rinse, when I think to. I've since added the rinse twice a day to my routine, and I'm really excited to see if it helps! My husband and I are both adding it to our routine, and while it is early yet, I can tell that I really like using it. It's not harsh (alcohol-free) and has a pleasant taste. Since I'm likely to stick with products that won't cause me to change my habits too much, I think I have a good chance of seeing some noticeably positive changes in my oral health. To read up on this new product, visit the Crest website. We'll be back at the end of our test drive to tell you how it went! *Disclaimer: I wrote this review while participating in a test drive campaign by Mom Central on behalf of Crest and received a sample to facilitate my candid review. Mom Central sent me a gift card to thank me for taking the time to participate.